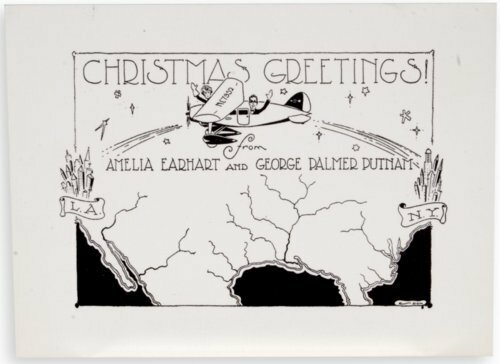 Christmas card from Amelia Earhart and George Putnam. Printed in black on off-white colored paper. The donor's family knew Earhart and Putnam, and the couple stayed with the family when they visited the British Isles. Putnam and Earhart met in 1928 when the publisher contacted the aviatrix to ask her to become the first woman to fly across the Atlantic as a passenger. They were married in 1931. Earhart disappeared over the Pacific during an attempted around-the-world flight on July 2, 1937.